Not much happened on the markets this week. The Dow fell 0.3% on the week, and the S&P 500 was down 0.2% on the week, for the second consecutive weekly decline. The precious metals were similarly stagnant. Gold on Monday was as low as $1,490; on Friday it closed at $1,492.90. The silver story was similar, albeit with more volatility. On Monday silver traded down to around $35.21, which is where it closed on Friday. 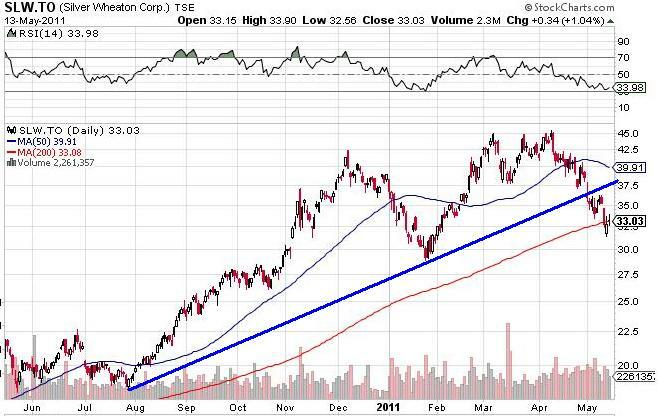 The thick blue line from the low in April 2009 remains intact, and will still be valid for prices down to $20. 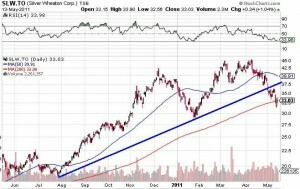 The green line, drawn off the November and December lows in 2008, was obviously violated throughout 2010, but the 2011 surge put us back above it, and in remains intact above $30. The real question is this: has anything changed? Is the economy “better”? Is the debt problem over? I think not. Ultimately everything reverts to the mean, which is to say that ultimately we get back to where we should be. You could flip a coin five times, and it could come up heads four times, and you may conclude that the coin is biased towards heads. Unfortunately your sample size is not large enough to draw that conclusion. Try flipping that same coin one hundred or one thousand times, and the results will revert to the mean, which is to say about half of the flips will be heads, and half will be tails. Looking at gold and silver in the first few months of this year you would conclude that silver was headed to $100, and gold would easily reach $2,000. 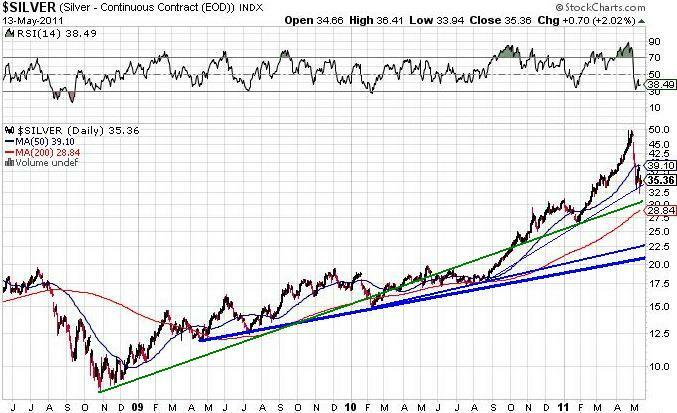 Looking at both of them now and you would conclude that silver may drop to $20, and we might see $1,000 gold. Both assertions may be correct, but again, remember, everything eventually reverts to the mean. Eventually the true value of precious metals, and everything else, will become apparent. The game for the U.S. dollar is over. Yes, I realize that today there may appear to be a “flight to quality” as last month’s precious metals investors decide to seek the “safe haven” of the U.S. dollar. Longer term, however, what could possibly tempt the Chinese and other foreign investors to buy U.S. dollars? Since the peak in the early part of this millennium, it’s been all down hill. Yes, there have been a few pauses, but it’s quite obvious that the U.S. is pursuing a “weak dollar” policy. They have no choice. Without a weak dollar they have no chance to sell any exports, leaving no chance to attempt to revive the economy. Unfortunately foreign investors see this, so for years they have gradually liquidated their U.S. dollar reserves, which of course continues to put downward pressure on the U.S. dollar. They have no choice but to put those reserves in something that has a chance of retaining it’s value: gold and silver. 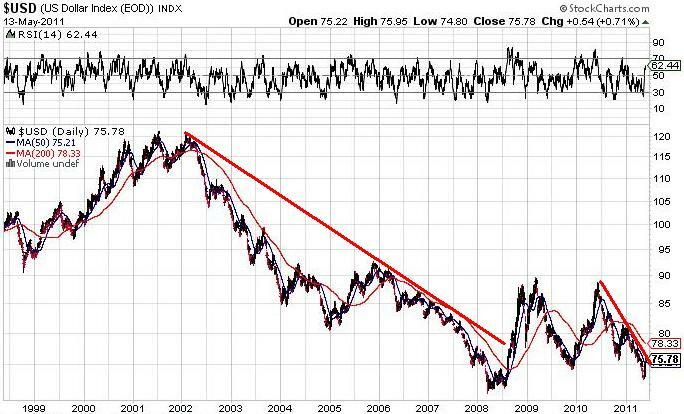 So, longer term, the precious metals will go higher. That leaves you with a choice: sell now, in the hopes that over the next few weeks or months you can buy gold and silver bullion and stocks at lower prices. Or, hold, because trying to catch the exact bottom is a fool’s game. 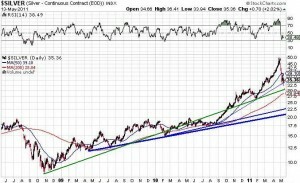 Obviously SLW.TO – Silver Wheaton Corp. has dropped below medium term support. But with the RSI bouncing off the 30 level, how much lower can it go? It’s already dropped from $45 to below $32; that’s a 30% correction. Sure, it could drop another 40% down to $20, but so what? Is the price of silver going to collapse for the next few years? Will there be no demand for silver in electronics? Will investors abandon it? I doubt it. So, we start placing our stink bids, at progressively lower numbers, and we buy all the way down. If there is a “flash crash”, we buy lots, because longer term it’s going up. Patience is the key, because we remember that eventually everything reverts to the mean.